As a result of the FOIA data dump, we now had much better background knowledge of the case as well as detailed info on the tracks of the initial searchers. We knew that on a list Bill had made, he had shown Smith Water Canyon as a possible visitation spot. This suggested he knew there was year round water in the canyon. If Bill had reached the top of the Quail Mountain ridge and had some sort of medical issue (say a twisted ankle) that made the 6 miles back to his vehicle seem questionable with the water he had, it was conceivable he could have instead tried the 2 miles north to Smith Water Canyon. From the ridge that terrain looks fairly easy. However what’s not visible is the steep and nasty descent to the canyon bottom. 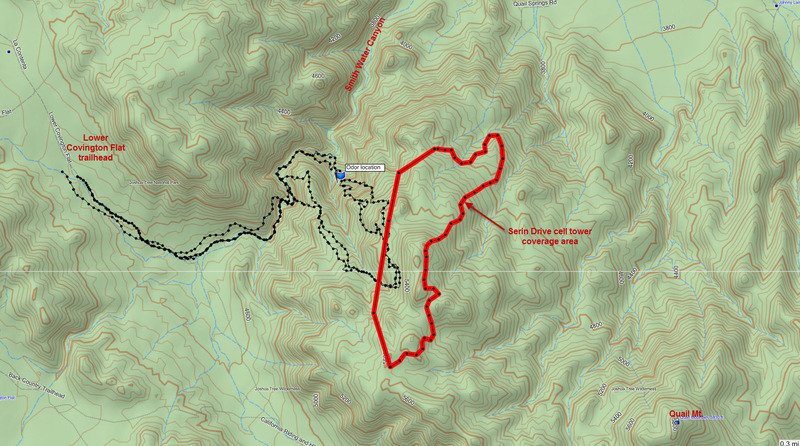 We also found there was a possible route that could have taken Bill over the Quail Mountain ridge and to the south slopes of Smith Water Canyon without pinging a cell tower until right at the crest of the southerly Smith Water Canyon rim. This increased our interest in Smith Water Canyon, as well as the relatively unexplored area in between. There was another factor. During the initial search on Tuesday, June 29th, 2010, Team 2 was assigned a search route that took them through Smith Water Canyon. They reported what they deemed “a suspicious odor” on the southerly slopes of Smith Water near 34.02738, -116.27537. They were not able to find any source for the odor, nor did a later team doing a followup on their report. While reviewing our previous GPS tracks, combined with the detailed tracks we now had from the initial search, we saw no searching had been done between the odor and the top of the southerly rim, an awkward area to get to. As we had been up top on our Smith Water death march, JT27, we knew the area and how to best search it. The area was generally at an 11 mile distance from the Serin Drive cell tower, although only the upper areas of the southerly slopes would have coverage. The ascent to just below the southern canyon rim was made along a spine to the west of the odor location. This was steep but reasonable terrain. However continuing east and descending was very difficult due to the steep terrain and large rocks. Paul and I had split up for the descent, but converged toward the coordinates of the reported odor. While we were still hundreds of feet above the location, we were able to see large areas below, and scanning with binoculars showed nothing out of the ordinary. Very good for the coordinates of the odor location and nearby, but only fair for the upper reaches of that slope, due to the crappy terrain. Given Paul’s previous experience in Smith Water Canyon, I’m impressed to no end he could be talked into coming back. This time on the way out I had worked out a strategy to traverse the lower part of the south wall of Smith Water Canyon from the dry waterfall to the westerly end of the meat eating bushes, thus avoiding mayhem and blood loss. After a short climb, we were able to travel almost horizontally as the canyon floor rose toward us. We rejoined the canyon bottom just as the damnable bushes ended. I think I heard them calling out Paul’s name. On the panorama shown below, the shrubs of death and dry waterfall are at the canyon bottom, to the left. Click on the panorama to enlarge it. The canyon between our ascent and descent had been searched by a team from Sierra Madre SAR and we planned out route around their GPS tracks, which we now had. The Sierra Madre guys are some of the absolute best, so we had confidence the areas covered by them were completely cleared (In fact thanks to the FOIA I knew who the specific team members were who went up that canyon, and they were the best of Sierra Madre). They had done great work climbing up out of Smith Water Canyon and heading toward the south doing some pretty impressive coverage. We focused on areas they hadn’t gone (i.e., their leftovers).